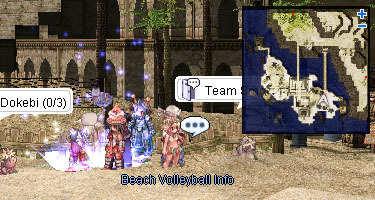 Beach Volleyball is a minigame that was introduced on August 03, 2012. It's hot. The sun is shining. You visit the beach with your friends. What are you going to do? Play a match of Beach Volleyball, of course! Talk to Beach Volleball Info (cmd_fild07 256,112) west of the Beacon Island warp point to view the rules in-game. You must be Base Level 30+ to play Beach Volleyball. 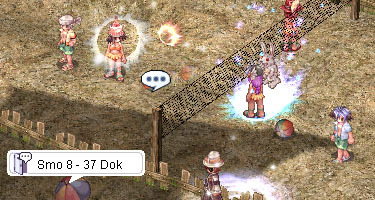 Enter either the Team Smokie or Team Dokebi chatroom to join a game. The game will automatically start when both chatrooms are full and there are no characters currently playing a match. 1000z will be deducted from each player. Your goal is to have fewer Penalty Points than the other team by the end of the 5 minute match. The Beach Volleyball Score (cmd_fild07 231,96) NPCs on either side of the volleyball court display each team's Penalty Points. 2 pts If the ball remains on the net for more than 10 seconds, the last team that touched the ball will receive penalties. 5 pts A team fails to return the ball from their side of the field within 10 seconds. 20 pts The ball hits the backline of a team's court. This can happen if you bump your ball in the wrong direction or if the opposing team lands a critical strike. Each player on the winning team is rewarded with a Beach Volleyball Bag. During summertime, players will usually have the opportunity to win the Beach Treasure Chest. A cute bag full of sea shells and other stuff that you can find on the beach. Upon opening, there is a chance to be transformed into a random maritime monster with special properties. Account-bound item. A treasure chest that was found on the beach! It contains rare items. How to Win at Beach Volleyball, a player guide. All the itty bitty teeny tiny games within The Game. This page was last modified on 22 June 2016, at 17:36.